Almost ten years after president Obama marked the bottom of the financial crisis, when on the day the S&P hit 666, the president gave the green light to buy stocks on March 3, 2009, saying - rather bizarrely - that "what you're now seeing is profit and earning ratios are starting to get to the point where buying stocks is a potentially good deal if you've got a long-term perspective on it", president Trump also urged Americans to buy the dip when on Tuesday he suggested that the recent swoon in the stock market is a buying opportunity for investors. "We have companies, the greatest in the world, and they’re doing really well," Trump told reporters at the White House on Christmas Day. "They have record kinds of numbers. So I think it’s a tremendous opportunity to buy. Really a great opportunity to buy." Trump's invocation to BTFD came one day after the most violent Christmas Eve selloff on record, and the day when the S&P fell not only to its lowest level in 20 months, but also slumped into a bear market. 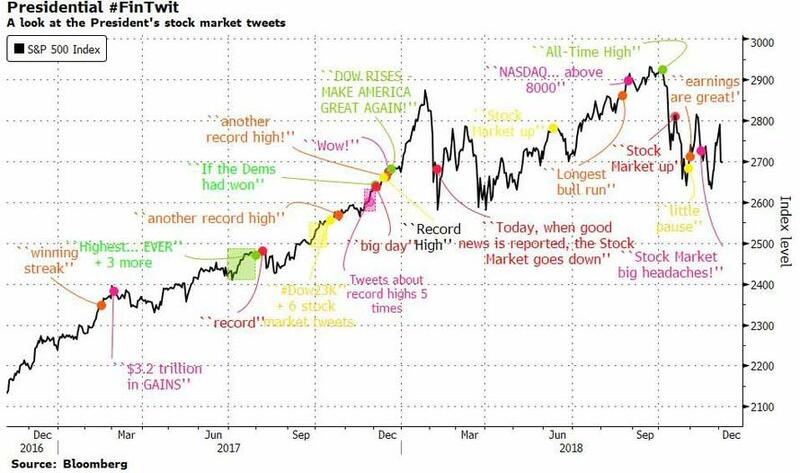 For Trump, the stock market has served as a barometer on his administration, and while he was pointing out virtually every major uptick for the past two years, the recent plunge has infuriated him, leaving him mute on any market-related topic. Trump's response: "yes I do, very talented guy, very smart person." Trump’s Oval Office remarks on Tuesday contrasted with an angry tweet on Monday saying "The only problem our economy has is the Fed. They don’t have a feel for the Market, they don’t understand necessary Trade Wars or Strong Dollars or even Democrat Shutdowns over Borders." 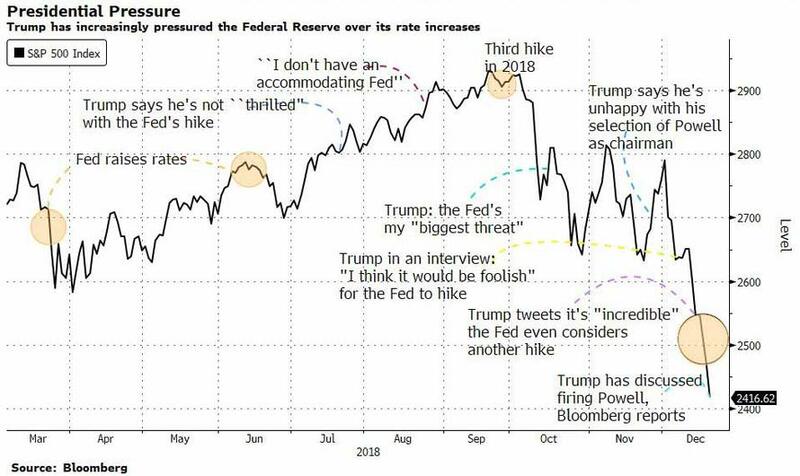 Previously, Trump had unleashed a litany of complaints about the Fed's rate hiking pace, as summarized in the chart below, raising concerns that the Fed may lose its "independence" if Powell is seen as folding to Trump's demands or if Trump replaces the Fed chair as a result of the recent market drop. Trump's latest remarks on the Fed may be seen as bullish by the market as they alleviate somewhat concerns that Trump would try to remove Powell, even if the president didn’t explicitly say that he won’t fire the central bank chief. Mnuchin said in a pair of tweets Saturday evening that he’d spoken with the president about the matter, and he quoted Trump saying he didn’t believe he had the authority to remove the Fed chairman. Trump’s "safety" comment is a reference to the Fed's ability to lower rates from higher if and when the economy starts contracting, giving the economy a greater cushion in case of a downturn. This is also known as the "hiking rates now to lower them later" approach. Incidentally, according to the Fed Funds market, as of Monday's rout, the odds for a January 2020 cut are now higher than for a hike, indicating that the market is now pricing in an easing cycle and/or a recession starting in just over one year.